The ships MFV Geo Searcher, MFV Edinburgh, MV Baltic Trader, and SA Agulhas II make about 9 return trips from Cape Town to Tristan da Cunha each year. Three ships are scheduled to make 9 return trips from Cape Town to Tristan da Cunha each year. Three (MFV Geo Searcher, MFV Edinburgh and MV Baltic Trader) are operated by Ovenstone as part of a contract to run the Tristan fishery, and the fourth, SA Agulhas II is operated by the South African Government as part of a contract to lease Gough Island as a Meteorological Station. The SA Agulhas II provides a cargo and passenger service to Tristan da Cunha each spring, normally departing Cape Town in early September. This is part of a lease arrangement of Gough Island to the South African Government where they maintain a Meteorological Station. So the ship travels out to Tristan, then on to Gough for the annual exchange of personnel and cargo supply. The voyage gives passengers an opportunity to have a stay of about three weeks on Tristan, making it a very popular, and busy trip for visitors since the early visits by South African Naval Frigates, then the RSA from the 1960s followed by SA Agulhas from 1978 - 2011, and now SA Agulhas II. 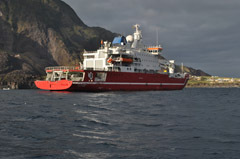 The SA Agulhas II also services bases on Marion Island and SANAE IV Antarctica in a busy annual programme. Ordered to replace the ageing SA Agulhas by the South African Government in 2009 it was constructed in Rauma, Finland between September 2010 and its launch on 21st July 2011. It was fitted out and completed by April 2012. 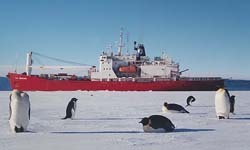 SA Agulhas II is designed as a Polar Supply and Research Vessel and in Arctic sea trials successfully navigated ice up to .6m or 2 feet thick. Max. breadth: 22 metres (72 ft). Draft: 7.65 metres (25.1 ft). She is served by a crew of 45. 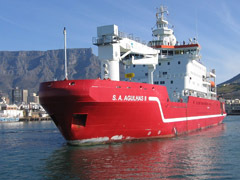 Built as both a polar supply ship as well as a research vessel, SA Agulhas II has both onboard laboratories for scientific research as well as cargo holds and tanks for supplies for South African polar research stations. In addition she has accommodation for 100 passengers in 46 cabins and facilities such as gym, library, business centre and a 100-seat auditorium. Aboard are eight permanent and six containerised laboratories for different fields of marine, environmental, biological and climate research totaling 800 square metres (8,600 sq ft). Deep-water probes can be launched either via a large door in the side of the vessel or, if the ship is operating in ice-infested waters, through a 2.4-by-2.4-metre (7.9 by 7.9 ft) ' moon pool'. A drop keel containing transducers for the measurement of plankton density and ocean currents can be lowered 3 metres (9.8 ft) below the bottom of the ship. A hydraulic A-frame in the stern of the ship can be used to tow sampling nets and dredges. SA Agulhas II has a hangar and helideck capable of serving two Atals Oryx or Puma helicopters. She also has two fast rescue craft, which are on standby during helicopter operations, and two fully enclosed lifeboats for 75 personnel. Her ice class, PC-5 means that she is designed for year-round operation in medium first-year ice. Her decks are heated to prevent ice accumulation in temperatures as low as −35 °C (−31 °F). SA Agulhas II is the first ship of her kind to be built to the new SOLAS 2009 rules for passenger ships, leading to several unique aspects in her design. SA Agulhas II is powered by four diesel generating sets, each producing 3,000 kW (4,000 hp). In order to fulfil international maritime regulations the main engines are located in two separate engine rooms and the ship is capable of returning to port with one engine room flooded. In case of emergency electricity is provided by an emergency diesel generator. The ship has 4.5-metre (15 ft) controllable pitch propellers, giving a maximum speed of 16 knots (30 kph; 18 mph) in open water, but her service speed is slightly lower, and at 14 knots (26 kph; 16 mph) her operating range is 15,000 nautical miles (28,000 km; 17,000 miles). SA Agulhas II first arrived at Tristan da Cunha on her inaugural Gough voyage on 12th September 2012, carrying 41 passengers including returning Islanders, visitors and workers. Photo right from Administrator Sean Burns shows SA Agulhas II at anchor off the 1961 lava flow with the Tristan Settlement of Edinburgh of the Seven Seas behind. 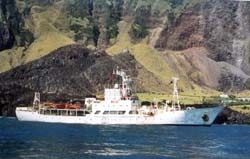 Ovenstone operate the Tristan da Cunha fishery, and as part of the contract with the Tristan Government, operate a regular shipping service of 8 trips a year from Cape Town to Tristan da Cunha and back. MV Baltic Trader replaced MV Kelso in 2009. Both ships can carry up to 12 passengers. Geo Searcher was acquired by Ovenstone in 2016. It was originally built in 1982 for scientific research vessel and was converted in Gdansk, Poland, to a factory freezer vessel with cargo and passenger capacity. It made its maiden voyage to Tristan in April 2017 as the island's main fishing vessel. 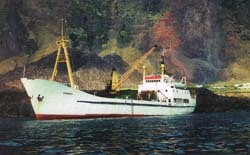 MV Edinburgh was built in 1970, and was previously named MV Hekla after the active Icelandic volcano. She entered Tristan fishing service in the 1980s, has a crew of 35 and can carry 12 passengers. Baltic Trader was obtained from Norway by Ovenstone to provide additional shipping to transport materials and equipment for the new factory after the February 2008 fire. It is a cargo ship and is not equipped for fishing. 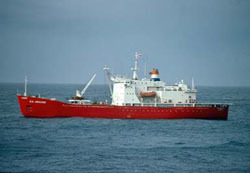 After the sale of MV Kelso, MV Baltic Trader became the sister ship of MV Edinburgh in 2009. The ship was operated by the South African Government's Department of Environmental Affairs & Tourism, Directorate: Antarctica and islands. 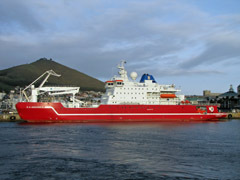 SA Agulhas' last Tristan-Gough voyage was in 2011 as it was replaced for 2012 by SA Agulhas II. The SA Agulhas is a now dedicated cadet training ship currently (2018) under the command of the South African Maritime Safety Authority (SAMSA). The Agulhas used CHC Helicopters who operate Bell 206 and Bell 212 helicopters which transported passengers to and from Tristan especially in the event of poor sea conditions. The 6767 tonne RMS St Helena was the last ocean-going Royal Mail Ship and is one of only two remaining passenger-cargo liners. It was withdrawn from service and put up for sale in February 2018, at which time it carried 56 officers and crew, and 156 passengers. Built in 1989, its facilities include a swimming pool, library, lounge bars and a restaurant capable of serving 6 course dinners. The previous RMS provided an annual scheduled service from 1985-1989. Its successor provided an annual scheduled service to Tristan from 1990 - 2004, when the regular service, which enabled Tristan to import goods direct from the UK, was withdrawn. Afterwards, the RMS returned on special cruises in February 2006 to celebrate the 500th Anniversary of the island's discovery, in January 2011, in November 2013 to commemorate the 50th anniversary of Tristan's Re-Settlement after the 1961 volcanic eruption, a "final" voyage in April 2016, and an extra final voyage in January 2018.